Grilled Southwestern Shrimp Salad is a super quick, 15 minute salad that’s perfect for a busy weeknight dinner! 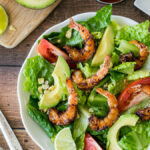 Grilled Southwestern Shrimp Salad is filled with tender, grilled shrimp, creamy avocado and roasted corn, all served over a bed of greens and drizzled with a lime-cumin dressing. The weather is heating up here in the desert. We’ll be in triple digits before you know it and the last thing I’ll want to do is turn on the stove or oven. That’s the perfect time to take it outside and crank up the grill. Luckily the shrimp in this cool and refreshing salad only take a few minutes to cook up! This salad also includes one of my favorite summer vegetables – corn! Technically corn is not a vegetable, it’s a grain. But last summer I grew corn in my garden, so that’s close enough for me. Are you gardening this year too? I haven’t had time to plant my garden yet, but to my surprise I’ve got 3 volunteer zucchini plants that have popped up all on their own! Sweet! Be on the lookout for more zucchini recipes later this summer then! But in the meanwhile, let’s talk about this salad! 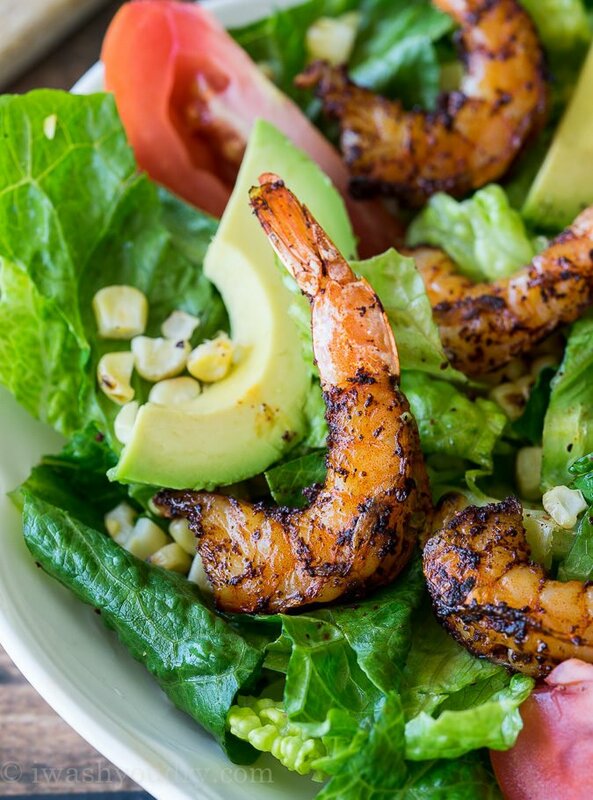 Tender shrimp that’s perfectly seasoned and grilled to perfection, creamy and cool avocado, grilled corn, juicy tomatoes, all on a bed of greens. 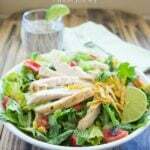 It’s the perfect Summer salad! You’re going to love this simple and easy salad for those warm summer days! Soak the wooden skewers in water for at least 20 minutes. Combine all ingredients in a small bowl (or mason jar) and whisk together until combined. Preheat grill to medium-high heat and brush with oil. 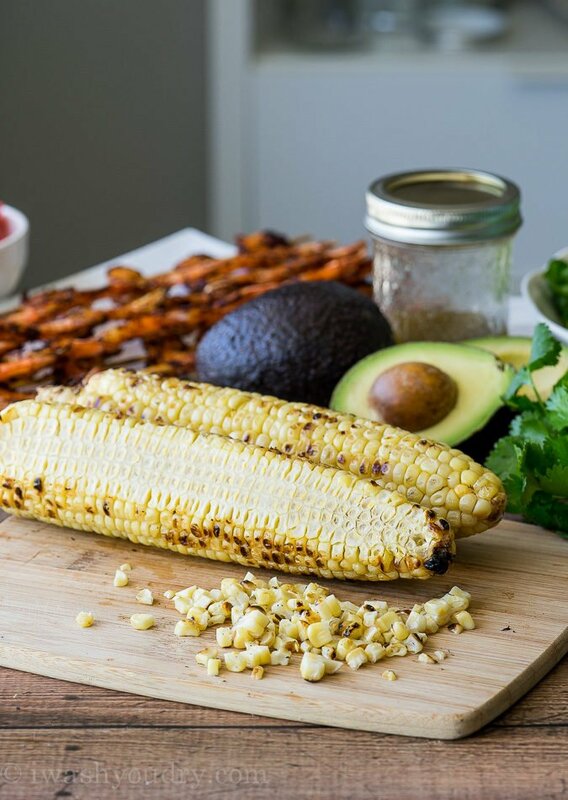 Place corn on grill rack to roast for 12 minutes; turning occasionally, once charred slightly, remove the corn kernels and discard the cobs. Sprinkle both sides of shrimp with chili powder, salt and pepper and thread onto the wooden skewers. Add the shrimp to the grill over medium heat and cook 3 minutes on each side, until cooked through. 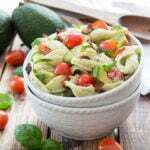 In a large bowl add the Romaine lettuce, corn, tomato, and Lime-Cumin dressing, toss to coat. Divide salad into 4 bowls. Top each bowl with the skewered shrimp and sliced avocado. Enjoy! Originally published on 8/6/2010. Updated images on 5/30/2017. I am enjoying this salad as I’m typing. It is flavorful and extremely easy to prepare. Thanks for the recipe!! 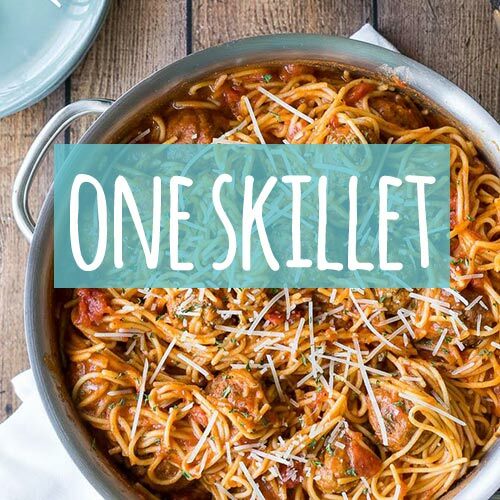 great recipe, but all the ads on this page are so annoying. Won’t be using this site again. I’m sorry you found the ads intrusive. 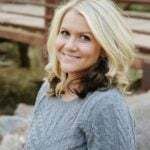 They do help to cover the costs of running a website to give you the free recipes you’re enjoying. But so glad you enjoyed this recipe. Absolutely love this recipe. 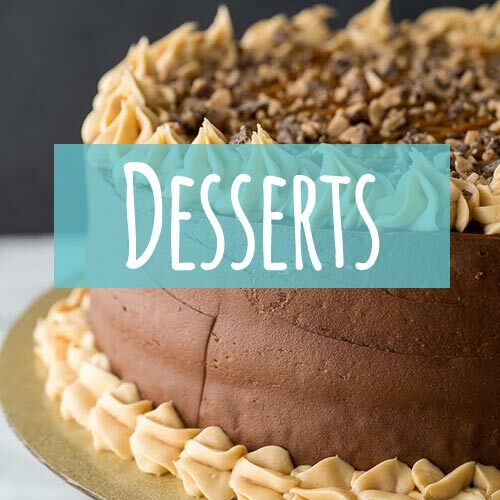 So delish and easy to make. Jumped here accidentally and realize that I haven’t made salad for months. How could I forget this delicious and healthy dishes?! 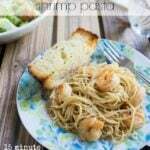 Gonna make this tonight! This salad is Awesome! Whole foods!! High Fiber!! Light and tasty. I used butter instead of olive oil to make it a bit more whole. 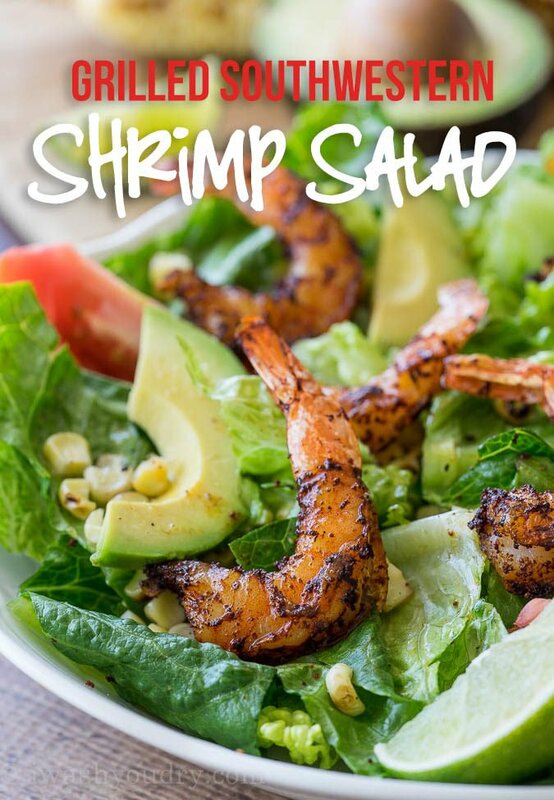 The nicest thing about this salad is that all you really need is the lettuce, shrimp and avocado…if you are missing the corn or tomato, it’s ok. I love it when volunteer plants just pop up in my garden, haha. 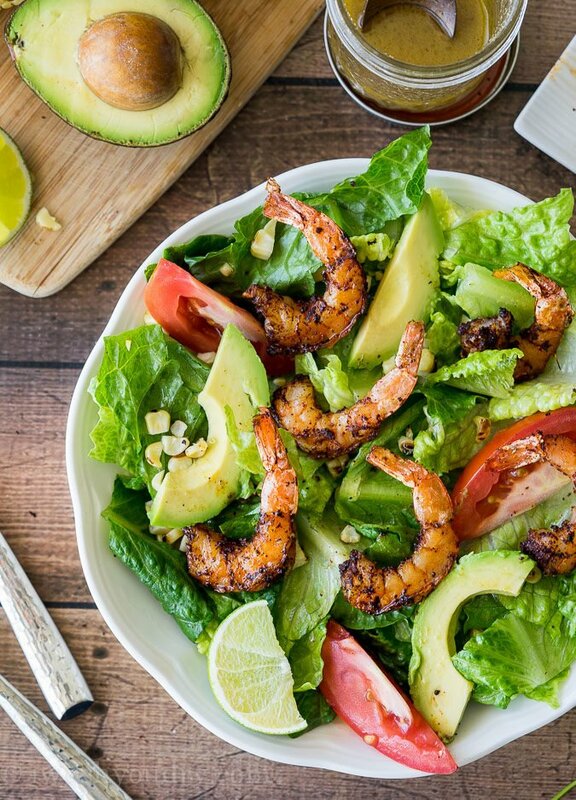 This shrimp salad looks amazing! I just happened to see this on Facebook. I am now following your FB page. Can’t wait to try this. Thank you. Have you thought about including the nutritional information for your recipes? That would be so helpful.